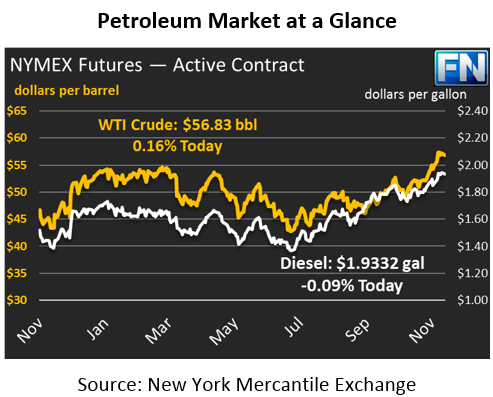 Oil markets let off some steam on Friday; crude closed with small losses that caused prices to dip below $57/bbl. Markets are unchanged this week, continuing the relatively flat movements seen last week. Prices are up just 9 cents currently from Friday’s closing cost, failing to regain the $57 level. Crude is currently trading at $56.83. Refined products are also training flat. After shedding a penny on Friday, diesel prices are flat, down just .17 cents to trade at $1.9332 this morning. Gasoline has been more volatile lately, though the numbers show relatively calm net results. Gasoline prices shed about half a cent on Friday, and are trading flat this morning at $1.8105. Market driving news once again focuses on the Middle East this morning, though is less political in nature. On Sunday, A severe 7.3 earthquake on the Iraq/Iran border killed over 300 people. So far, the earthquake has not had an impact on oil prices, though it did impact the oil-rich Kurdistan region. Additionally, a terrorist attack on an oil pipeline in Bahrain caused a supply disruption, but without major market consequence. On the bearish side, Iraq announced that they would be increasing production in Kirkuk following reduced supply while Iraqi forces took control of the field. OPEC Secretary-General Mohammad Barkindo said over the weekend that production cuts are the “only viable option” for returning oil markets to stability. Market sentiment is increasingly pointing to an extension to OPEC’s production cuts, which currently are slated to expire in March 2018. How long the cuts are extended, and any possible deepening of the cuts, will be decided during OPEC meeting at the end of November.